There are dozens of Italian cookbooks on my shelves. It’s a cuisine I return to time and time again, because it’s accessible, exciting and packed with flavour. Its reliance on good ingredients, cooked simply, cooked well suits my own approach to food. Most of all, the food of Italy never stops surprising me – the twists, turns, variations and intricacies of it are seemingly endless. There’s always something new to try, something new to experience. And here’s another angle – cicchetti, the Venetian tradition of small plates or dishes, a kind of Italian tapas. 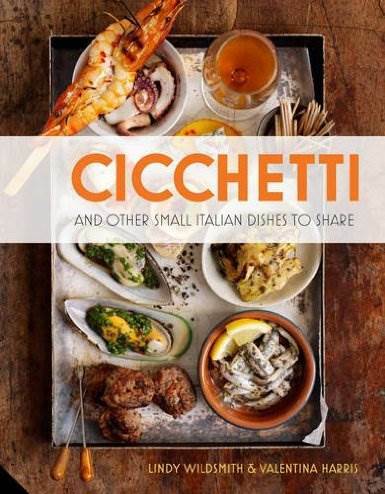 Lindy Wildsmith and Valentina Harris’ book, Cicchetti has two approaches, focusing firstly on the cuisine of the city of Venice and the region around, and secondly on the spread of similar dishes, called spuntini, piccoli cibi or stuzzichini elsewhere, across the rest of Italy. is a collection of small plates characteristic of this style of Italian food, and includes recipes for many types of dishes, ranging from simply served hard-boiled eggs through to stews of tripe and porcini, fritters of cod, Tuscan paté and crostini loaded with chopped liver. There’s huge variety here, but the key theme is one of simplicity – many recipes are short, easy, quick to make, with an emphasis on the quality of the ingredients and their seasonality, and getting the best out of the food by, well, not overdoing the cooking. It’s a good philosophy, a solid approach to food, and one that encourages restraint and lets the food speak for itself. This isn’t to say that Wildsmith and Harris’ book is some sort of pre-school canter around Italian food … far from it. Quite the opposite. This is a book with a tremendous amount of passion for the cuisine it celebrates, a book that’s been carefully thought through and lovingly put together. Wildsmith’s first half focuses exclusively on cicchetti from Venice, Harris’ second half builds on this base and expands it across the rest of the country, capturing select examples of similar types of food from the far corners of Italy. This approach shows how a style of food develops and emerges as the signature of a particular place, and how that speciality is reflected across the rest of the land. Venice is merely a place where the idea of small plates has taken hold and been distilled to an art form. is one of those books that fills a gap. It’s full of good little ideas, ways to pair flavours and textures together. It isn’t fussy, or over-worked, it’s just a passionate cook book that knows its niche and seeks to celebrate it.